Marine mammal and seabird sightings were recorded from a hilltop overlooking the Billia Croo wave test site. Data were collected to provide information on distribution and ‘relative’ abundance of animals in and around the study area. The study area encompassed a hemispherical shape extending offshore from the coastguard lookout site, covering the whole of the Billia Croo wave site and areas surrounding the wave site. 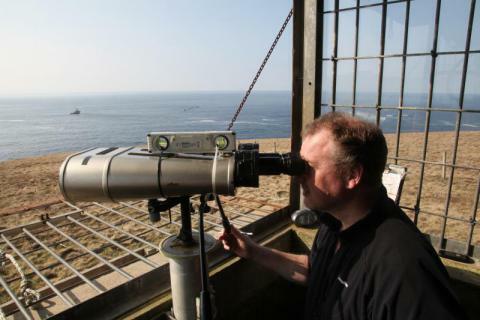 The study area extended to approximately 5km from shore as this is around the sighting limit for small cetaceans from a clifftop this height (around 90m). Observations were made with a pair of fix-mounted 25x power binoculars (Big eyes). These were mounted on a robust tripod with horizontal and declination angle boards to allow estimates of the geographical locations of wildlife to be made. EMEC Billia Croo Wildlife Observation Data is located in United Kingdom.